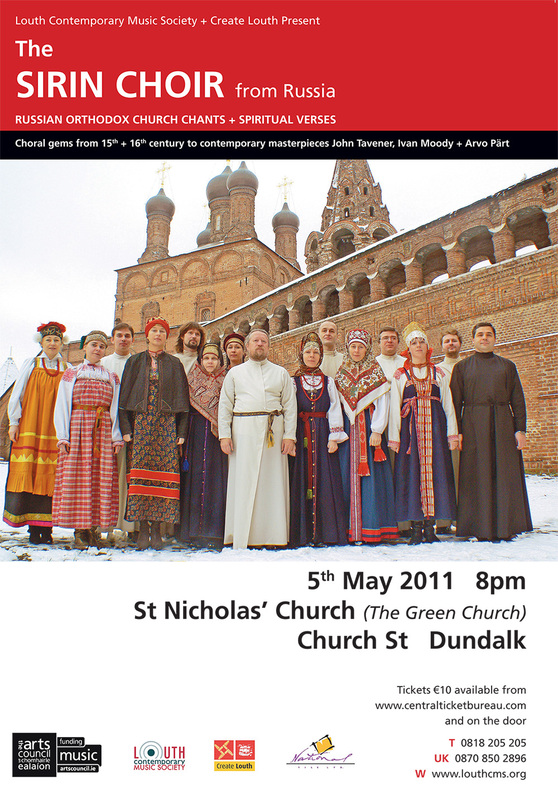 The amazing Sirin Choir from Russia will perform in St.Nicholas’ Church ( The Green Church) Dundalk on 5 May 2011. 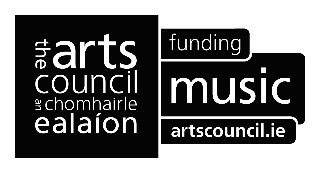 The programme will include modern day choral masterpieces such as Louth Contemporary Music Society Commissions Arvo Pärt’s The Deer’s Cry and John Tavener’s O My People along with a selection of Church Chants and Spiritual verses from the 15th and 16th centuries.Some of the Church Chants will be performed a cappella with a selection of the spiritual verses accompanied by hurdy-gurdy, psaltery or violin. Sirin Choir was formed in 1989 by a group of professional musicians who took the name after a bird of Paradise from Russian Christian legends. Before that Andrey Kotov, Sirin’s Artistic Director spent many years studying Russian sacred folklore in rural settings where these ancient traditions are still preserved. His research has meant that Sirin is uniquely able to present repertoire ranging from the dark, sonorous style of Old Believers’ church to the haunting songs of spiritual wanderers. The ensemble has presented its interpretation of Russian church and spiritual folk music on extensive concert tours in Russia and Europe and was multifold prizewinner of renowned choral competitions. Sirin took part in the 1st European Symposium for Choral Music in Ljubliana, World Symposium for Choral Music in Rotterdam, gave performances at various festivals, like the festival in Thoronet and the festival of Old Lyon (France), Musica Sacra in Marktoberdorf (Germany), Old Music in Jaroslaw (Poland), Musica Sacra in Maastricht ( Holland), Trialogos (Estonia), Isle de France , Lufthansa Baroque Festival (Great Britain), Cork International Choral festival (Ireland), Sacred Music in Fribourg (Switzerland), Festival of Sacred Music in Fez, Bangkok Christmas Festival (Thailand), Europalia (Belgium) and many others. Sirin’s performances were included in the program for celebrating 2000 years of christianity in Jerusalem. As a special request of Sirin, the Russian composer Vladimir Martynov set texts from the Old Testament’s book The Lamentation of Jeremiah to music. The stage version of The Lamentation of Jeremiah, where all roles are performed by Sirin members, had more than 150 performances in Russia, France (as part of the official program of Avignon Theatre Festival), Italy, Germany, Estonia and Sweden. It was awarded with Golden Mask, the highest distinction in Russian theatre, as the best theatrical production of the year. 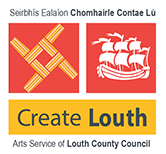 The Sirin Choir is funded by the Arts Council Touring Award and financially supported by Create Louth. The Concert’s sponsor is National Tile.